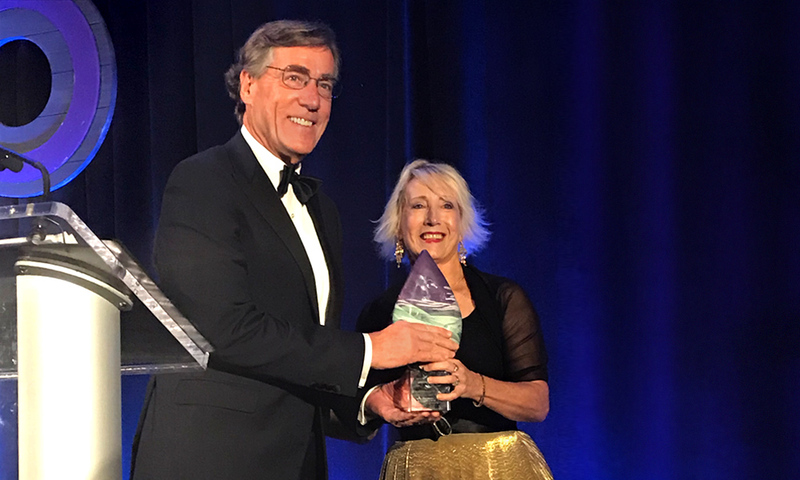 Utah’s arts groups are offering a standing ovation to Zions Bank, which received a prestigious national award at a New York City ceremony on Oct. 2. The Utah company has been added to the Americans for the Arts’ BCA 10 list, celebrating the country’s ten best businesses partnering with the arts. The bank was the only Utah company named to this year’s list, which also includes Kentucky’s Churchill Downs and Texas’ Phillips 66. In 2017, Zions made grants to more than 60 different arts and cultural organizations, while the company also curates a collection of more than 4,000 works, which are exhibited at branches and corporate offices. Zions was also added to the national list in 2008. To mark the national recognition, we’re highlighting stories that underscore the range of Utah cultural programs receiving grant funding from Zions Bank and the Utah Division of Arts & Museums. “There should be a work of art in every home. Or Death Star. Or escape pod,” says Wendi Hassan, executive director of the Cache Valley Center for the Arts, describing a photograph of a cosplaying Stormtrooper viewing paintings at Logan’s Artist’s Gallery, located just north of the Ellen Eccles Theatre. Sponsors help the nonprofit agency present touring shows that wouldn’t otherwise perform in Logan, such as the 2017 performance by Charlie Ross of his “One Man Star Wars Trilogy,” Hassan says. “Our wonderful 20-year partnership with Zions Bank has allowed the Natural History Museum of Utah to bring a compelling, object-rich exhibit to the heart of a different Utah community 11 times each year,” says Ann Hannibal, the museum’s associate director for community relations, of the Traveling Treasures exhibit. This year’s exhibit focused on “Nature’s Ultimate Machines,” and included a series of Science Camp events, which also included examinations of minerals, bugs, shells and dinosaur fossils. The exhibit demonstrates the range of cultural projects Zions’ Bank funding supports. Now in its 22nd year, Opera by Children is an educational program of Logan’s Utah Festival Opera & Musical Theatre that has reached more than 98,000 students. Mentors work with teachers throughout the state to help students write their own production, and along the way to a performance, create a creative community in their classroom. The fun-loving title of the Monster Drawing Rally underscores what sets apart the annual event: It’s designed to break down barriers between artists and art lovers. At the rally, artists are invited to create a new work in 50 minutes. And then art lovers have the chance to buy pieces for $50 in a live auction. “It’s an event that breaks down barriers, as it makes art collecting more accessible,” says Jocelyn Scudder, director of programs and engagement for the Park City Summit Country Arts Council. “We’ve had a lot of people start their art collections at the Monster Drawing Rally, while the event offers a platform for emerging and established artists,” says Jocelyn Scudder, director of programs and engagement.